GREENSPEC® Approved and Helps Qualify for LEED® credits. A. Hand dryer cover shall be a one-piece, heavy-duty, rib-reinforced, die-cast zinc alloy. It shall be lightweight, unbreakable, rustproof and all exposed surfaces shall be bright chrome plated or finished with chip-proof, electrostatically applied epoxy paint and fastened to a wall plate by two chrome plated tamper-proof bolts. B. Hand dryer wall plate shall be equipped with (3) 7/8" (22 mm) diameter holes, one of which shall be suitable for use with surface conduit, for ease of wiring. C. All internal hand dryer parts shall be coated according to Underwriters' Laboratories, Inc. requirements. A. 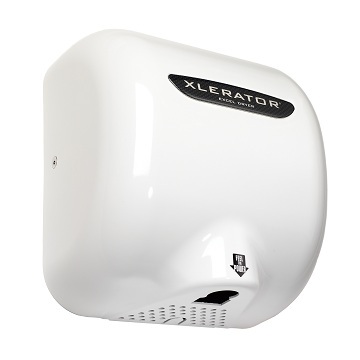 Hand dryer motor shall be a series commutated through-flow discharge vacuum motor/blower (5/8 HP / 20,000 RPM) which provides air velocity of 16,000 LFM (linear feet per minute) at the air outlet and 14,000 LFM at the hands (4 inches [102 mm] below air outlet). B. Hand dryer heating element (900 W) is constructed of Nichrome wire and mounted inside the blower housing, thereby being vandal proof. It shall be protected by an automatic resetting thermostat, which shall open whenever air flow is cut off and shall close when flow of air is resumed. It shall produce an air temperature of up to 135°F (57°C) at a 72°F (22°C) ambient room temperature at the hands (4 inches [102 mm] below air outlet). C. Hand dryer Control assembly is activated by an infrared optical sensor located next to the air outlet. The dryer shall operate as long as hands are under the air outlet. There is a 35-second lockout feature if hands are not removed.